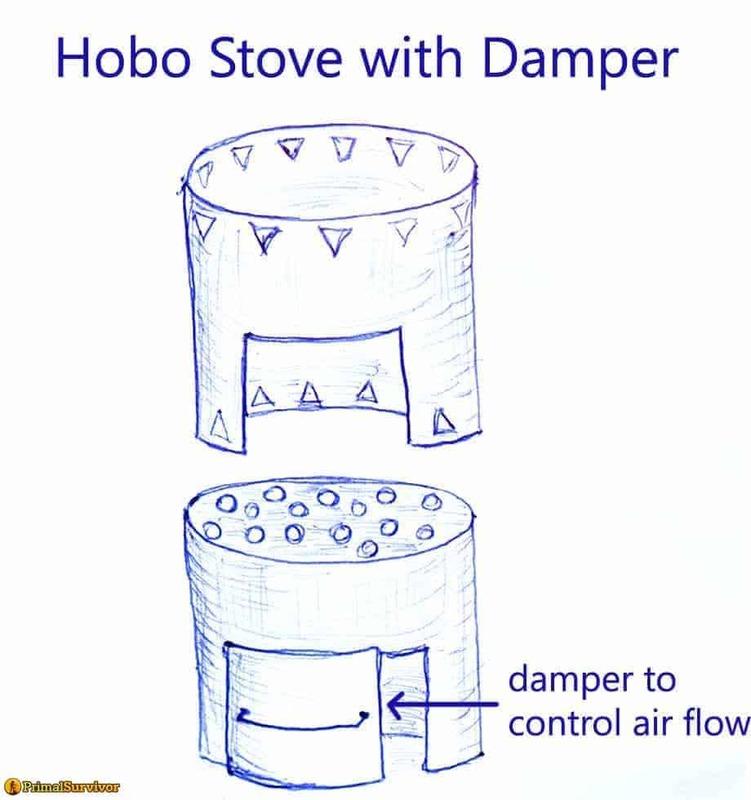 Hobo stoves are really simple stoves made from cans. They get their name because they were used by hobos and tramps during the Great Depression. Hobo stoves have experienced a comeback in recent years. 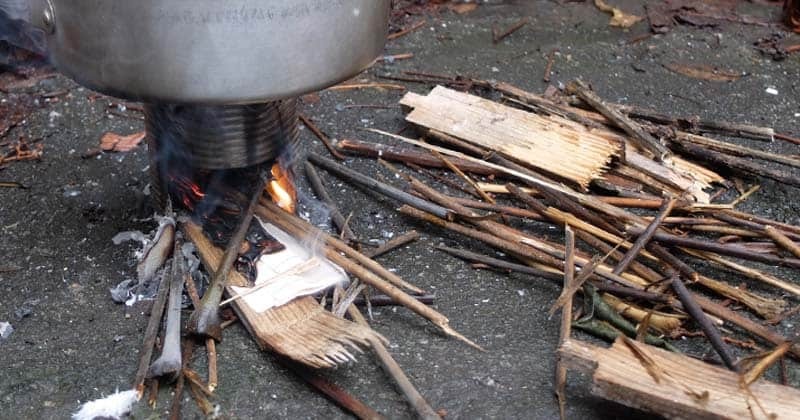 Here’s what you need to know if you want to make a DIY hobo stove. 2 What Makes Hobo Stoves So Great? 3.1 So, when should you use one? 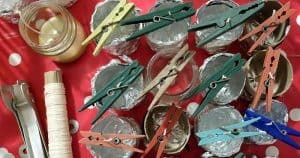 There are so many ways to make a hobo stove. Everyone claims that their design is the “best.” Rather than trying to present you with what I think is the “best”, I’m going to give you several designs and let you experiment for yourself. You’ll also want a Sharpie for marking the can. A metal file is great for sanding down sharp edges. Depending on the design, you might need another can, a piece of metal, or a piece of wire. This is the most basic version. Note: The biggest mistake people make with hobo stoves is not making enough air vents. Once the stove is full of sticks and has a pot on top of it, air flow will be hindered. So don’t skimp on the vents! Traditionally they are made with the top of the can upwards. The bottom of the can stays in place. This allows the stove to be sturdier. 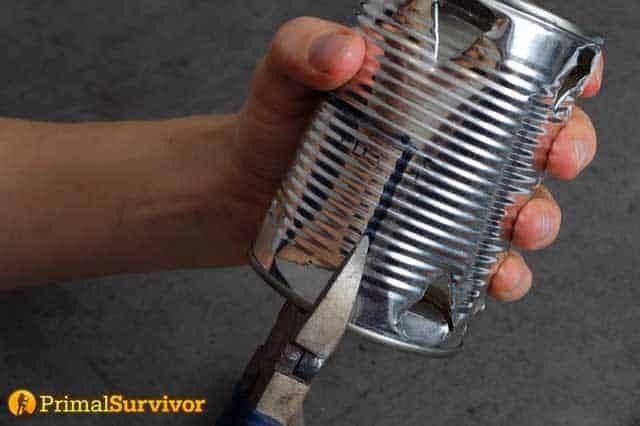 The bottom of the can will also catch embers, which makes it safer to use indoors. However, it is a lot easier to cut out a door when the top of the can is downwards. 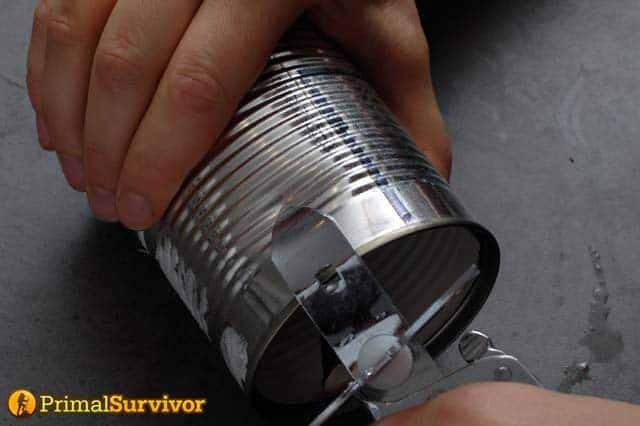 You just remove the lid and start snipping the door away (if you don’t do it this way, you’ll have to create a hole in the can so your tin snips have an entry point). Also, when the top of the can is upwards, you can use it as a cooking surface for your pot – no additional pot stand required! Another benefit of leaving the bottom of your hobo stove open is that it’s easier to create a fire in it. You can actually start the fire outside of the stove, get some good coals going, and then set the hobo stove on top of these coals. Bottom stays intact, making the stove sturdier. The bottom of the can will catch embers, making it safer to use indoors or around dry brush. It’s harder to cut a door in the can. You’ll have to create a hole in the can so your tin snips have an entry point. Creating the door is easier. The bottom of the can serves as a pot rest – just punch some flame holes in it. Can create the fire outside of the stove, then just set the stove on top of it. 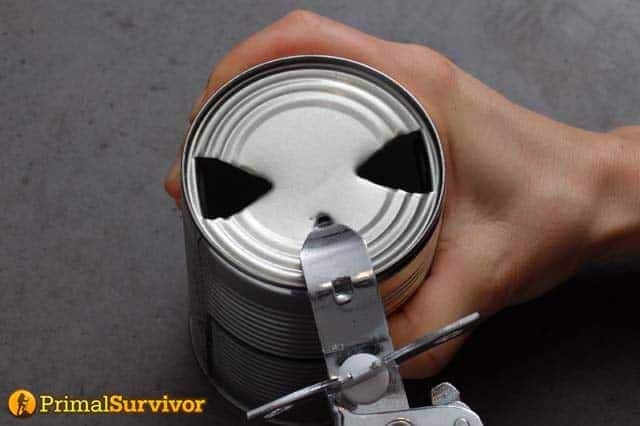 If the bottom of the can is upwards, you’ll need to punch some holes to allow flames through. 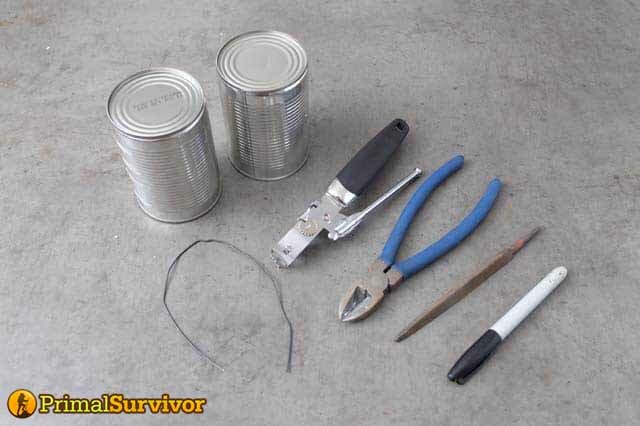 If the top of the can is upwards, you may need to make some holes for metal skewers to go through. These will be your pot stand. Punch air vents all along the top and bottom of the can. To make them evenly spaced, I will make a hole on one side, and then make a hole exactly opposite of it. Then I make holes on the sides. On my small soup can stove, I was only able to make 4 vents on the top and another 4 on the bottom. My bottle opener is really big though. Draw the door on your can. Then cut it out. This will be the most difficult part! I like to have a fairly large opening so I can get sticks inside. However, you don’t want the door to be so large that the can loses stability. I like this hobo stove design best because it is easy but works much better than the basic hobo stove. This works best with a LARGE CAN, like a paint can. However, you can still use this method with a smaller can. 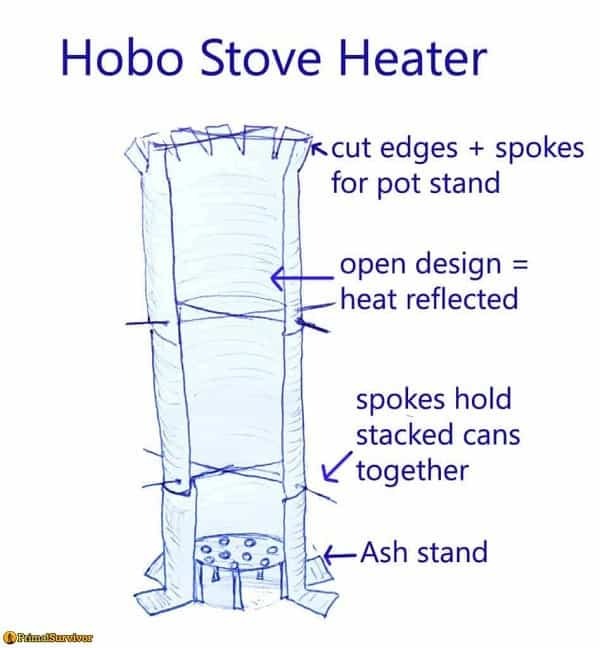 You will need an extra piece of metal for this hobo stove design. Using a hammer and nail, create many holes in the metal circle you just drew. Widen the holes with a screwdriver or other sturdy object. The holes need to be big enough for ash to fall through but not so large that the embers will fall through. Create legs for the stand. Do this by cutting slits in the metal around the circle you drew. Cans are designed so they can be stacked on top of other cans of the same size. You can take advantage of this feature to make an ash stand. 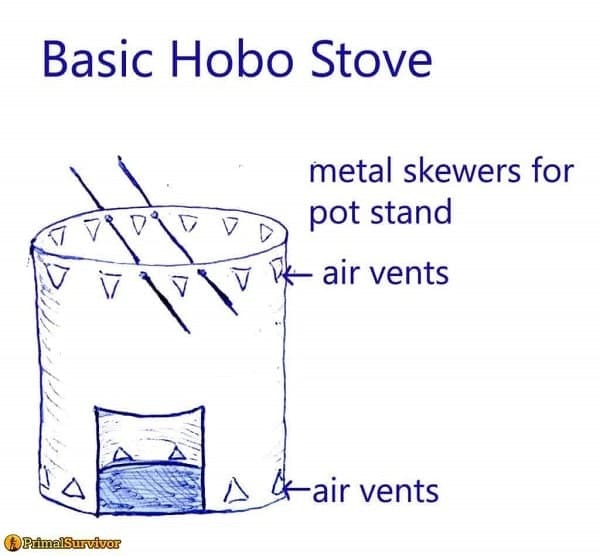 Step 1: Create a basic hobo stove: The BOTTOM of the can should be upwards! Otherwise the cans won’t stack right. In the bottom of the can, punch holes. I used a nail/hammer to create the holes and then widened the holes with a metal tool. Optional: Cut the can so it is shorter. 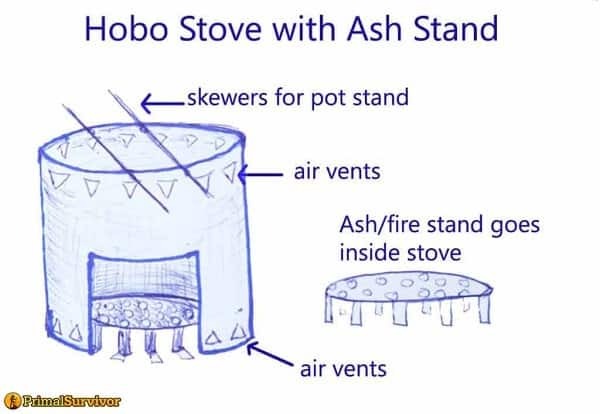 If the ash stand is too tall, then the hobo stove won’t be very stable. The second biggest issue with hobo stoves (after the flame going out due to inadequate air flow) is that you can’t control the flame easily. One solution to this it to create a “damper” – or a little door on your ash stand which can be open/closed for better air flow. 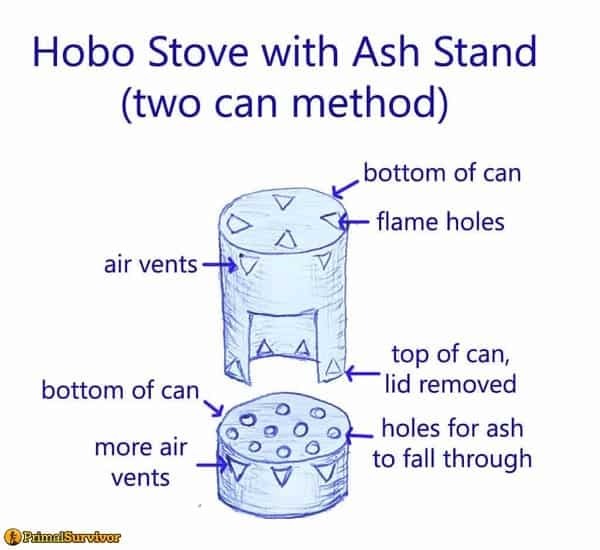 Step 2: Make your ash stand: In the diagram, I’ve used a second can to create the ash stand (as in design 3). The only difference here is that I cut out a door for air to flow into. Step 3: Make your damper: If you are careful when cutting out the door to your hobo stove, you can use this piece of metal for the damper. It helps to make a handle on the damper for moving it back/forth over the door. Using the Damper: When using a damper, the damper-door goes towards the wind. The fuel-door goes AWAY from the wind. I haven’t tried this design personally but it looks really cool. I found it here on a biking forum. 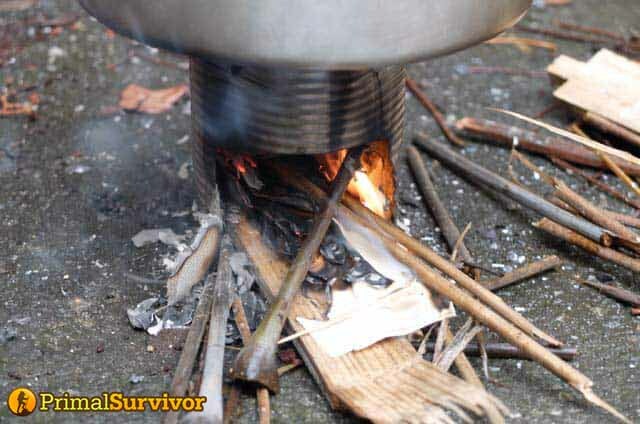 The hobo stove heater is made out of 3 large cans stacked together with spokes. The cans have been cut open so the fire heat is reflected back towards you. I can see some obvious problems with this design – like the fact that it is not portable and thus not practical for many situations. However, if you were hunkered down in one location for a long time (such as an abandoned building), this heater would be great. What Makes Hobo Stoves So Great? Even though they are so simple, hobo stoves work very well. You can use them for cooking food or boiling water. With some design modifications, you can even use them as a heater. Ability to use multiple types of fuel in them. Usually sticks or scraps of trash are used. However, you can also put a “tuna can stove” or “buddy burner” inside of them as the flame. 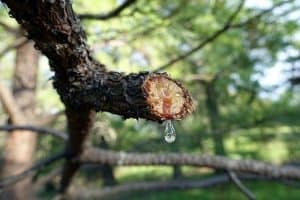 Easy to make: It helps to have some tools, however, you can make a very basic one with nothing more than a can opener, hammer, and nail. Or with just your knife. While I love hobo stoves and the DIY philosophy behind them, they definitely aren’t all that they are hyped up to be. Personally, I would never intentionally use a hobo stove in normal situations. When backpacking in the wilderness, I use a gas canister stove. They simply burn hotter and you can easily control the flame. Boiling water/heating food is much faster than with a hobo stove! My Primus stove (Amazon Link) boils 1/2 liter of water in less than 3 minutes! By contrast, it took 17 minutes to boil 1/2 liter of water on my hobo stove! If I needed an alternative method of cooking in the wild (such as if I ran out of fuel), I still wouldn’t use a hobo stove. I’d probably use a method for cooking over a campfire – such as by making a “crane” (if my pot had a handle) or cooking over a hot rock (if the pot didn’t have a handle). With small hobo stoves like this, it’s hard to keep the flames inside the stove. Plus, the pot is getting burnt to hell. 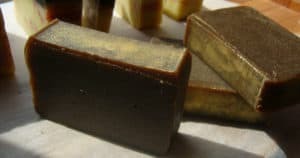 If you want to keep your pots looking clean and shiny spread dish soap on the bottom and sides of the pan allow to dry, use on fire, wash the soap and the black off after using. So, when should you use one? Yes, I know that there are a lot of survivalist types who actually go backpacking with their hobo stoves. The brand Kelly Kettle has even made a badass hobo stove (Amazon Link) which works great and is super lightweight. There is also the Emberlit stove, Firebox Nano, and Vargo Hexagon stove which are awesome because they fold flat and are very light. Professional stoves will get stolen. 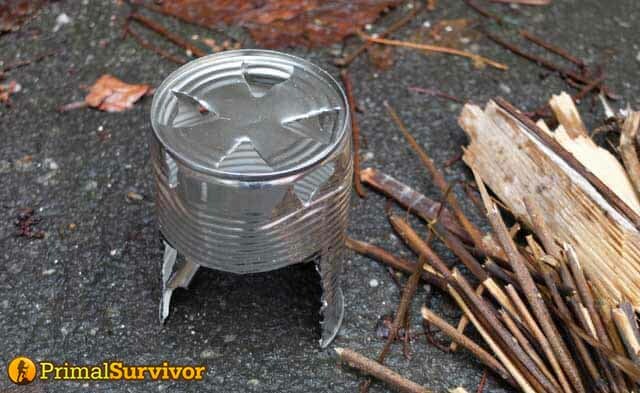 You can almost always find a can to make a hobo stove out of! You are in a large, well-vented abandoned building (an alcohol stove will be much better for indoors because it makes less smoke). The Vargo titanium stove weighs only 4.1oz and folds flat — it’s better than anything you can make yourself but comes with a fairly high price tag. A rocket stove is another type of survival stove which can be made out of cans. Instead of using just one can, a rocket stove uses two cans. The first can is the “flue.” The second can goes inside the “flue” and is where you put the fuel. I personally prefer hobo stoves over rocket stoves. It only requires one can and you get better air flow. However, rocket stoves can also be made from many other materials – such as stacked-up bricks, cinder blocks, and clay. You can also get a much larger fire going inside of a rocket stove. You can check out 9 DIY rocket stove designs here. So, there you have it — 5 stove designs. Have you made one? Which design did you use? Let us know in the comments! 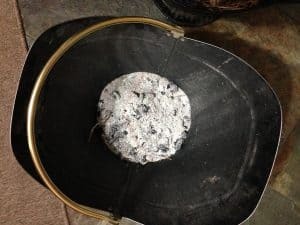 If you want to keep your pots looking clean and shinny spread dish soap on the bottom and sides of the pan allow to dry, use on fire, wash the soap and the black off after using. Awesome tip!, its so good we have added it to the article. Hope you don’t mind. Thanks White.